Rex Mehta is the President & CEO of US-based Dollarstore Corporation, a franchiser of consumer retail stores in the US and elsewhere. It is also a wholesale B2B marketplace that streamlines the buying and selling of general merchandise for independent dollar stores and related retailers, franchise stores and international distributors. 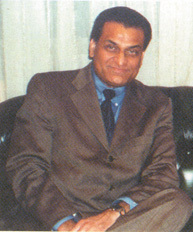 An e-commerce pioneer, Mehta established Dollarstore.com four years before today's Internet became popular and also founded Business Internet Connection in 1995. With Dollarstore's entry into India imminent, I am set to become a unit of this country's dynamic and multifaceted retail structure. As is our international practice, in India too, we will be setting shops and expanding through the franchise route. I am very excited about franchising the Dollarstore Concept In India. I feel that Indian Business People are very savvy and we can empower these individual franchisees with the buying power of Dollarstore Corporation and linking their store with a web-based, state-of-the- art affordable Point Of Sale system. As a franchiser operating in the world's most prosperous nation, I cannot help but have an eye on one of the world's most promising markets. And in my opinion, Indian retailing has evolved by leaps and bounds over the past decade, from largely an 'informal' and disorganised marketplace to the increasingly corporatised industry that it is today. As someone of Indian descent and education, I am familiar with India's heritage, multiplicity of cultures and practices. I am also well aware of the inbuilt Indian penchant for value-for-money goods and services. In the past, consumers in developing countries were paying for the same item more than the consumers in, let us say USA. The reason was artificial barriers created by the Local Governments to protect indigenous industries. The scene is now changing due to Globalisation and countries joining the World Trade Organization. At Dollarstore Inc., we realised that consumers everywhere - of whatever origin - want and deserve credible value for their money. And most are more discerning than we retailers give them credit for. Most know the extra price a 'branded' good commands and what that extra is payable for. The world's most popular brands command high prices due to the value addition that a 'brand' signifies, in terms of quality, 'aspirational' image and status that it accords to a wearer or user. But, in the end, the function and very often, the lifetime of products with differential pricing but similar usage, is pretty much the same. An Acetaminophen is a painkiller; so is a Tylenol. But, the latter is a branded product. Which, somehow seems to suggest that it has higher medicinal value. This is not necessarily true. Acetaminophen is just the generic form of Tylenol. At Dollar Store we offer the same medicine for less than one third of branded products. My vision of Dollarstore is based on 'Deep Discount Retailing' and Variety of the products that is why I work on taking 'branding' out of retailing. Now this may sound absolutely nonsensical to many. In fact, some may even find this contradicting the basic definition of organised retailing, which is built on growth and expansion of recognised national and global brands. But, think of retailing as a service industry. Also, remember that the world's largest company - Wal-Mart, is a discount retailer. This is a business enterprise founded and operating for mass-market consumers, giving them what they need most at down-to-earth prices. At Dollarstore, we realise that every day there is incredible value offered to the world consumers in the form of closeouts, surplus, liquidation and excess inventories. One man's junk is another man's treasure. For example, a two-wheel scooter, which was being retailed for $49 in USA Dollarstore, can be bought for $1 in bulk quantities and offered to Indian consumers at an incredible price. India is a huge market to target. Because, at the end of the day, a middle-class family kid can afford the same scooter as a film star's kid. This article is reprinted from IMAGES New Delhi, India.